"The words and pictures carved into the concrete and the wooden tekotekos holding up the surrounding chain tell not one, but many stories. At the monument's base is carved the Arawa canoe which arrived at Maketu about 25 generations ago. At the top is Rehua, the star that guided them on their epic journey from Hawaiki" excerpt from Daily Post, March 28th 1979, p1. 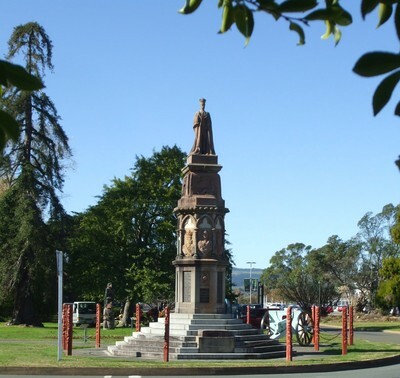 The full article with a description of all the detail on the memorial is available to read on the 2nd Floor of Rotorua District Library. A history of the memorial written by Roger Steele can be found in 'The Government Gardens" by Paula Savage p29-32. Restoration project is under way with funding from "The Lotteries World War One Environment & Heritage Fund; NZCT; RECT and Te Puia. Commenced November 2016 to be completed by Armistice Day 2018. See Daily Post 15 Feb 2016, 7 Nov 2016.